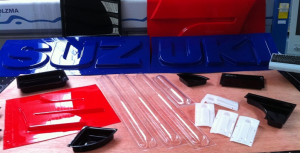 Collins Plastics have over 35 years experience in cutting, moulding and fabricating all types of plastic sheeting. We have come across many complicated projects and have always risen to the task at hand. We use state of the are machinery in our purpose built factory in Ballina, Mayo, Ireland. Our capabilities include: Cutting, CNC routers for cut letters, beam saw computerised saw cuts, laser cutting for a polished finish and diamond cutting. We specialise in forming, thermoforming trays and lightboxes, line bending profiles, vac forming shapes, membrane pressing & drape forming profiles, blow moulding domes and rooflights with diamond polishing for a glass look finish. Then off to assembly where our team of fabricators show off what they can do!! !